A while back I described what happens during the Weekly Planning Meetings my older girls and I have each week. Though these lesson plan meetings will continue this school year, I’ve decided to update the tool the girls use to plan their weekly assignments. This new system will allow us to plan more quickly and easily. Instead of using a notebook to record weekly assignments, the girls will now be using the 8.5×11″ Student Planning Page I recently designed. This new page is larger than the notebook the girls used last year and offers them more room to record their assignments. The Student Planning Page also eliminates the time consuming process of spacing and dating notebook pages. I designed The Student Planning Page for students in middle and high school. This single planning page has a separate section for each day of the school week. Each of these sections features a place to write up to eight subject names and corresponding assignment details. In addition, there is a column for students to check off completed assignments. It’s easy to use the Student Planning Page. When you’re ready to plan the week, print a copy. Gather the school books and sit down with your child. Have your child complete the page by filling in the assignments that need to be completed during the coming week. Once it’s filled in, punch holes in the planning page and stash it inside a three ring binder or a pronged folder. This will help you keep track of the school year’s lesson plans. This new Student Planning Page is a great planning resource, so I’m offering it to AAHM readers as well. 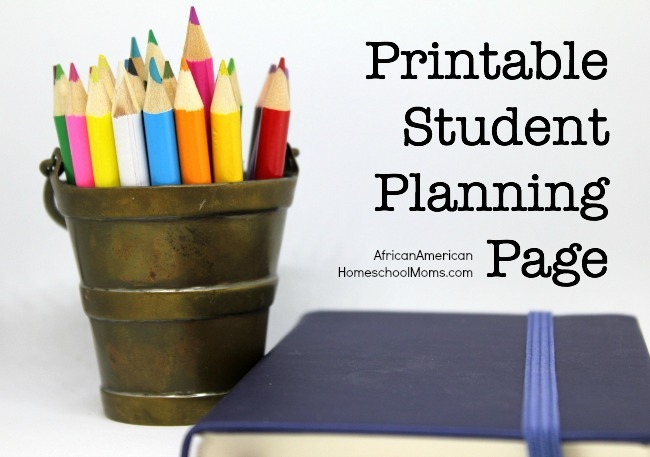 Click the link to download the Student Planning Page. I hope you find it helpful!